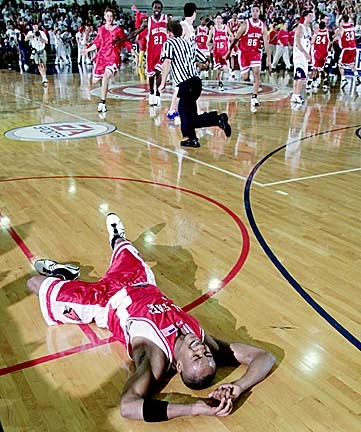 I guess if you beat a Top 5 team at the buzzer, you can take a breather. That is Patrick Jackson, or Petey as he was known to fellow students. He looks tired. He looks happy. I guess when you hit a buzzer beater to defeat Kansas (ranked #4) in the Maui Classic, I’d say both those emotions apply. But it wasn’t just Kansas. Their reward for beating #4 on national television? A date the next night with #3 UCLA, who the Cardinals promptly ran out of the gym with an 18-point beating. The Cards would go on to lose to #1 Duke in the championship game, but they would enter the next week at #16 in the associated press poll. So as you watch upsets unfold over the next few weeks in the NCAA tourney, just remember that BSU has been there done that on the national television stage. With any luck, Coach Whitford may get them there again.